I'm still reading "Colorless Tsukuru Tazaki and His Years of Pilgrimage" in print - this past week was so busy I haven't had time to sit down and spend the time with it that it deserves. I had to give up on the new Tana French - I should have started with the first in her series, and will pick back up properly, starting with "In the Woods" in the future. 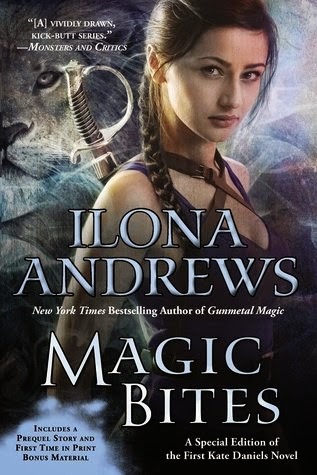 I started "Magic Bites," the first in Ilona Andrews's Kate Daniel urban fantasy series for something light & fun, and so far it it is fitting the bill nicely. 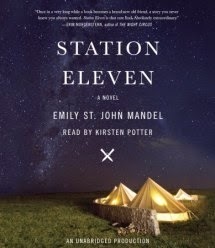 Finally, I'm tearing through "Station Eleven" by Emily St. John Mandel in audio, though the print copy came in at the library for me at the same time. I'll likely have finished it in one form or another by the time you read this! The Bookseller reports that nearly 3/4 of young people (aged 16-24) prefer print over other forms of books. I know I do. Author Celeste Ng writes a lovely piece about her first bookstore - Waldenbooks in the mall. Plus, you can get her book "Everything I Never Told You" free in audio if you join the Ford Audio Book Club on Goodreads & add the novel to your to-read shelf! The National Book Foundation announced their 5 Under 35 authors, each chosen by a previous National Book Award Finalist. Finally, this might be pushing literary, but it has to do with writing so it stays. Researchers in Sweden have been hiding Bob Dylan lyrics in their research for years.